The Crystal of the Day for Tuesday 8 October 2013 is Moldavite. Moldavite is a type of tektite, which are thought to have been created by various meteors landing on Earth. Moldavite comes in shades of green, from olive to deep forest. There are a rare amount of light, intensely Emerald green Moldavites that are referred to as “Poison” green. Moldavite can have a sharp, pointy appearance or a more pitted yet smooth look. 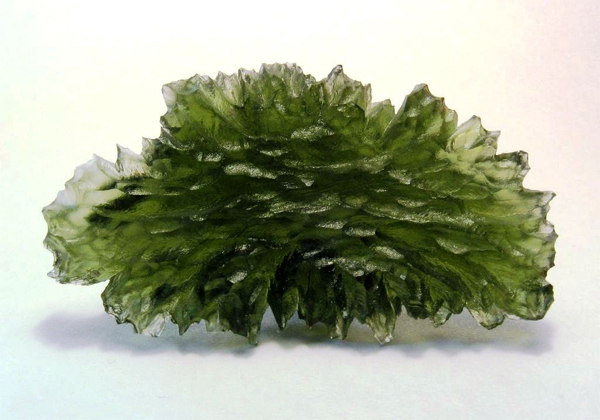 Moldavite is believed to have been used for thousands of years as a sacred stone. The excavation of the famous Venus of Willendorf found numerous items made from Moldavite, such as amulets, talismans and knife blades. This dates back approximately 25 thousand years ago. In Czechoslovakian history, Moldavite was believed to bring blessings and harmony to marital relationships and were given as a traditional betrothal gift. The green alien stone has even been linked to Arthurian lore and the Holy Grail, with one writing describing the Holy Grail not as a cup, but as a stone, while others hold that the Grail is a cup carved from a crystal emerald that fell from the sky. Today, Moldavite is used in carvings, religious artifacts and as various pieces of jewelry. Many people have credited their Moldavite stones as being the catalyst for dramatic and rapid life changes. Some even warn against purchasing this stone unless you are willing, able and ready to let go of the old and embrace the new. Transformation, communication and healing all seem to surround this stone in folklore, history and personal experiences, making it a truly unique and powerful stone to use for spiritual and healing purposes. 1. If it has a blue cast to it, it may very likely be bottle glass. Also, large pieces of moldavite are extremely rare so be aware of those & do your research. 2. Examine the moldavite with an eye toward colour and texture. Moldavites vary in colour from a dusty green to a deep olive hue, but the colours tend to be muted and dusky. While moldavites can be both smooth and spiky, no moldavites are as smooth and pristine as cut glass. If the moldavite you are examining is smooth, shiny and bright-green in color, you are most likely looking at a fake moldavite that was produced by melting green glass bottles into a new shape. 3. Pay attention to the source of your moldavite stone. Whilst vendors for moldavite are located around the world, moldavite itself is mined only in Eastern Europe, most commonly in the Czech Republic. The comet that is believed to have crashed into Earth, creating moldavite deposits upon impact, landed only once in what was formerly southern Bohemia. Minor deposits have been found in isolated pockets of Sweden, Austria and Germany, but comparatively little moldavite is mined in these regions. Therefore if the seller claims his moldavite was mined anywhere other than the Czech Republic, the stone is most likely a fake. 4. Be aware that the larger the moldavite, the higher the price. The largest moldavite ever mined weighed approximately 260 grams, just under half of a pound. Consequently, many retailers of fake Moldavite will try to scam potential customers with “inside deals” on even larger and more fabulous moldavites. In reality, stones weighing more than 30 grams are extremely unusual (especially if priced under £682 / $1,000), so moldavites weighing more than that should be regarded with skepticism. 5. Try to purchase moldavite in person from a vendor instead of anonymously online, in order to actually touch the stone. Many moldavite enthusiasts, such as the proprietor of Moldavite for Me, and new-age healers claim that the stone’s outer-space origins imbued it with unique energies and vibes. It is postulated that when you touch the moldavite your hands will tingle and you may experience dizziness and lightness in the head. While the touch test is not a guaranteed method of authentication, it is something to bear in mind when shopping for moldavite stones. I recently order one of the “black diamond moldavite” pendants. I thought it was off, but still ordered it. I don’t doubt that it’s fake moldavite. What is it though? I did and all, Austin! I don’t really know, if I’m honest, what it is! I thought, for the tiny amount it cost (I think it was about £1.04 on eBay!) I would buy it to see what it were like and without being able to test it, I would say it “looks” like black plastic, lol. I have read that there IS a black Moldavite but it goes through a bit different process in its “birth”. All I can say is, the green Moldavite is VERY expensive as it isn’t being mined any longer, therefore, I can assure you that my £1.04 pendant is NOT very close to being the real deal!, lol..
Black “moldavite” is still a tektite, and most commonly referred to as black tektite. It should never be called Moldavite. There ARE dark brownish green Moldavites. Not black. Buyers please beware.